What is Cite This For Me’s MLA Referencing Generator? Are you looking for an easy and reliable way to cite your sources in the MLA format? Look no further because Cite This For Me’s MLA citation generator is designed to remove the hassle of citing. You can use it to save valuable time by auto-generating all of your citations in an instant. Cite This For Me’s citation machine accesses information from across the web, assembling all of the relevant material into a fully-formatted works cited page that clearly maps out all of the sources that have contributed to your paper. Using an open-access generator simplifies the frustrating citing process, allowing you to focus on what’s important: completing your assignment to the best of your ability. Have you encountered an unusual source, such as a microfiche or a handwritten manuscript, and are unsure how to accurately cite this in the MLA format? Or are you struggling with the dozens of different ways to cite a book? If you need a helping hand with creating your citations, Cite This For Me’s accurate and powerful generator will get you one step closer to the finishing line. Continue reading our handy style guide to learn how to cite like a pro. Find out exactly what a citation generator is, how to implement the MLA style in your writing, and how to organize and present your work according to the guidelines. Why Do I Need To Reference? Whenever you use someone else’s ideas or words in your own work, even if you have paraphrased or completely reworded the information, you must give credit where credit is due to avoid charges of plagiarism. All of the source material that has contributed to your work must be acknowledged with an in-text reference (also known as a parenthetical reference) and feature in your works cited list. The only exceptions to this rule are everyday phrases (e.g. all the world’s a stage) and common knowledge (e.g. London is the capital city of England). The importance of referencing sources goes far beyond ensuring that you don’t lose points on your assignment for referencing incorrectly. Whilst it may be a tedious process without an MLA referencing generator, attributing your research is essential in validating the statements and conclusions you make in your work. What’s more, drawing on numerous sources elevates your understanding of the topic, and accurately referencing these sources reflects the impressive research journey that you have embarked on. So, what does MLA stand for? The style was developed by the Modern Language Association as a consistent way of documenting sources used in academic writing. It is a concise style predominantly used in the liberal arts and humanities; first and foremost in research focused on languages, literature, and culture. It is important to present your work consistently, regardless of the style you are using. Accurately and coherently crediting your sources both demonstrates your attention to detail and enhances the credibility of your written work. The MLA style provides a uniform framework for consistency across a scholarly document, and caters to a large variety of sources. So, whether you are referencing a website, an article, or even a podcast, the style guide outlines everything you need to know to correctly format all of your MLA citations. * The style also provides specific guidelines for formatting your research paper, and useful tips on the use of the English language in your writing. Cite This For Me’s MLA referencing guide is based on the 8th edition of the MLA Handbook for Writers of Research Papers. Our open generator also uses the 8th edition - allowing you to shift focus from the formatting of your references to what’s important - how each source contributes to your work. The style has been widely adopted by scholars, professors, journal publishers, and both academic and commercial presses across the world. However, many academic institutions and disciplines prefer a specific style of referencing (or have even developed their own unique format) so be sure to check which style you should be using with your professor. You can also find your university’s style by logging into your Cite This For Me account and setting your institution in ‘My Profile’. Whichever style you’re using, be consistent! If you’re battling to get your references finished in time, you’ve come to the right place. The generator above will create your references in the MLA referencing format by default, but it can cite any source in 1,000+ styles. So, whether your professor has asked you to adopt Harvard referencing, your institution uses APA referencing, or your discipline requires you to use OSCOLA referencing or Vancouver, you'll find the style you need on Cite This For Me's website. *You may need to reference a source type that is not covered by the style guide - for these instances we have developed additional guidance and examples, which stick as closely as possible to the spirit of the style. Where examples are not covered in the official handbook this is clearly indicated. How Do I Create and Format MLA in-text references? MLA referencing is generally simpler than other styles as it was developed to emphasise brevity and clarity. The style uses a straightforward two-part documentation system for referencing sources: parenthetical references in the author-page format that are keyed to an alphabetically ordered MLA bibliography. This means that the author’s last name and the page number(s) from which the quotation or paraphrase is taken must appear in the text as a parenthetical reference, and a complete corresponding reference should appear in your bibliography. Keep your in-text references as brief as clarity and accuracy permit by only including the information needed to identify the source. Furthermore, each parenthetical reference should be placed close to the idea or quote being cited, where a natural pause occurs – which is usually at the end of the sentence. Essentially you should be aiming to position your parenthetical references where they minimise interruption to the reading flow, which is particularly important in an extensive piece of written work. The examples in this section will demonstrate how to structure both your in-text references and bibliography entries. If the author’s name already appears in the sentence itself then it does not need to appear in the parentheses. Only the page number appears in the reference - this is called ‘author prominent’ because it draws attention to the author. Sontag has theorised that collecting photographs is a way “to collect the world” (3). Include the author’s last name and the page number(s) from which the quotation or paraphrase is taken in a parenthetical reference after the quote. This way of referencing foregrounds the information being cited and is known as an ‘information prominent’. “To collect photographs is to collect the world” (Sontag 3). When the author is referred to more than once in the same paragraph, you may use a single in-text reference at the end of the paragraph (as long as the work cannot be confused with others cited). If you are referencing two works by the same author, you should put a comma after the author’s surname and add a shortened title to distinguish between them. If there are two authors with the same surname, be sure to include their first initial in your reference to avoid confusion. You must include all of the publication information in your works cited entries. Luckily for you, we know where the commas go, and our open-generator will put them there for you. If referencing is giving you a headache, use Cite This For Me’s free, accurate and intuitive MLA reference generator to add all of your source material to your bibliography with just a click. How Do I Format My MLA Bibliography? A bibliography, or ‘Works Cited’, is a comprehensive list of all the sources that contributed to your work – each entry links to the brief parenthetical references in the main body of your work. An in-text reference only contains enough information to enable readers to find the source in the bibliography, so you’ll need to include the complete publication information for the source in your bibliography entries. Your MLA bibliography should appear at the end of the main body of text on a separate page. Each entry should start at the left margin and be listed alphabetically by the author’s last name (note that if there is no author, you can alphabetise by title). For entries that run for more than one line, indent the subsequent line(s) – this format is called ‘hanging indentation’. The title of the page should be neither italicised or bold – it is simply center-aligned. Like the rest of your paper the list should be double-spaced, both between and within entries. Sometimes your professor will ask you to also list the works that you have read throughout your research process, but didn’t directly cite in your paper. This list should be called ‘Work Cited and Consulted’, or ‘Works Consulted’, and is an excellent opportunity to demonstrate the full extent of the research you have carried out. As long as you clearly indicate all of your sources via both parenthetical references and a bibliography, it is very unlikely that you will lose points for referencing incorrectly. Anderson, Benedict. Imagined Communities. Verso, 1983. Fox, Claire F. The Fence and the River: Culture and Politics at the U.S.-Mexico Border. University of Minnesota Press, 1999. Sontag, Susan. On Photography. Penguin, 2008. Cite This For Me’s referencing generator will compile and structure your MLA bibliography for you. Racing against the clock? If your deadline has crept up on you and you’re running out of time, Cite This For Me’s generator will collect and add any source to your MLA bibliography with just a click. In today’s digital age, source material comes in all shapes and sizes. Thanks to Cite This For Me’s reference management tool, MLA referencing is no longer a chore. Accurately and easily reference any type of source in a heartbeat; whether it be a musical score, a work of art, or even a comic strip. Cite This For Me elevates student’s research to the next level by enabling them to cite a wide range of sources. Accurately MLA referencing sources for your assignment doesn’t just prevent the appearance or accusations of plagiarism - presenting your source material in a clear and consistent way also ensures that your work is accessible to your reader. So, be sure to abide by the style’s presentation rules on font type, margins, page headers and line spacing. It is worth bearing in mind that the MLA format is constantly evolving to meet the various challenges facing today’s researchers. Using Cite This For Me’s MLA referencing generator will help you to stay ahead of the game without having to worry about the ways in which the style has changed. Below is a list outlining the key ways in which the style has developed since previous editions. Titles of independent works (such as books and periodicals) are now italicized rather than underlined. You are encouraged to include a source's URL when citing a source from the internet. You are no longer required to include medium information at the end of your citation, i.e. Print, Web, etc. Including the city of publication is optional, and only encouraged if the version of the work changes based on location, or if it was published prior to 1900. How Do I Reference My Sources With The Cite This For Me MLA Generator? 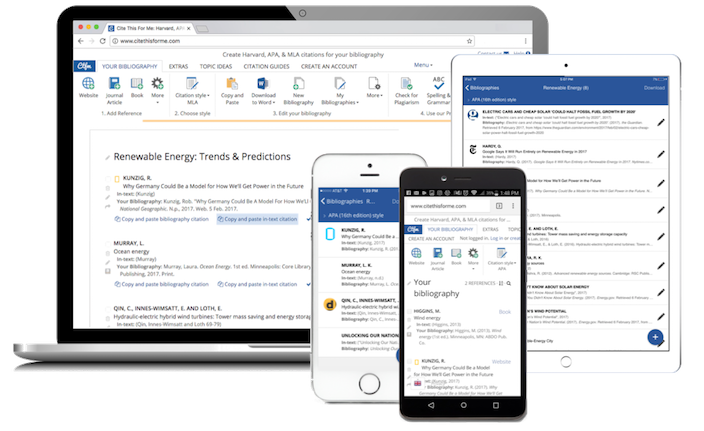 If you’re frustrated by the time-consuming process of MLA referencing, Cite This For Me’s multi-platform reference management tool will transform the way you conduct your research. Using this fast, accurate and accessible generator will give you more time to work on the content of your paper, so you can spend less time worrying about tedious references. So if you’re having issues with accurately formatting your references, sign up to Cite This For Me and let our MLA referencing generator do the grunt work for you. As well as making use of the powerful generator, you can cite in a flash by downloading the iOS or Android app. Sign up to Cite This For Me - the ultimate reference management tool.